Free hot continental breakfast free high-speed internet access and flat-panel TVs are some of the perks our guests appreciate at the Best Western Charleston Plaza Hotel. 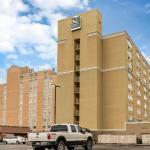 The Best Western Charleston Plaza Hotel has nine stories 160 rooms and interior corridors. Guests can kick back on their choice of a cushy king-size bed or two queen-size beds as they watch in-room entertainment on their flat-panel TV. You can sit at a spacious work desk and stay connected with free high-speed internet access. Rooms also feature mini-fridges irons and ironing boards. Hungry guests can sink their teeth into muffins and breakfast sandwiches at the free continental breakfast. Make that tight deadline with a stint in the business center or tighten up your abs with a stint in the well-equipped fitness center. You can cool off with a refreshing dip in the outdoor pool open seasonally. Parking is free. Located in downtown Charleston the Best Western is just a half-mile from Charleston Town Center a large enclosed shopping mall. Guests can walk a half-block to the Clay Center for the Arts and Sciences a 240000 square-foot center devoted to promoting performing arts and science. The West Virginia State Capitol is one-and-a-half miles away. The hotel is four miles from Yeager Airport.